We should honor and sustain in truth and in deed our priesthood leaders who are called to preside. President Joseph F. Smith sustained his priesthood leaders in his heart and in his actions. Repeatedly his labors echoed the faithful words of Nephi: “I will go and do the things which the Lord hath commanded” (1 Nephi 3:7). We raise our hands in token of a covenant to uphold and sustain our leaders. 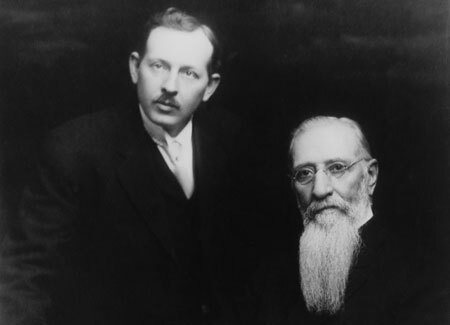 President Joseph F. Smith with his son Joseph Fielding Smith, who was a memberof the Quorum of the Twelve Apostles at the time of this picture in 1914 and later became the tenth President of the Church. As Latter-day Saints, we sustain and honor the General Authorities who are called to preside. Now, while the commandments of God are to all the world, there are some special commandments that are applicable to the Latter-day Saints only. What are they? One of these commandments is, that we shall honor those who preside over us; in other words, we shall honor the Priesthood. I ask no man to honor me, unless I do that which is strictly in accord with the spirit of my calling and the priesthood which I hold. No member of the Church is bound to honor me if I step beyond that priesthood and authority which has been conferred upon me by the choice of God and the voice of the Church. But when I do speak by the Spirit of the Lord in accordance with the duties of my office, it is proper for every member of the Church to hearken to that which I say. For if it is said by the Spirit of God and in accordance with my duty, it is the word and will of the Almighty. “And whatsoever they shall speak when moved upon by the Holy Ghost, shall be Scripture, shall be the will of the Lord, shall be the mind of the Lord, shall be the voice of the Lord, and the power of God unto salvation. “Behold this is the promise of the Lord unto you; O ye my servants” [D&C 68:4–5]. Men may become dissatisfied one with another, they may become dissatisfied towards the Presidency, the Quorum of the Twelve, or others, and may say in their hearts, “I do not like such an one; I do not believe he is as good as he should be, he has too many faults and weaknesses and, therefore, I cannot and will not acknowledge his authority, as I have not faith in the man.” Doubtless there are those, too many perhaps, who feel that way, but the trouble is, … just because they have become dissatisfied with the individual and harbored feelings of bitterness in their hearts against their brethren, they lose sight of the designs of the Almighty; they turn against the authority of the Holy Priesthood; and through their blindness allow themselves to be led astray, and at last turn away from the Church. Let us sustain our local authorities and listen to their counsel. Sustaining our leaders is an evidence of goodwill, faith, and fellowship on our part. Why is sustaining our leaders “one of the most important acts performed at the conferences of the Church”? Why is it helpful to realize that sustaining our leaders is a “covenant we make”? How can we sustain our leaders, not in “mere form, but in deed and in truth”? How have you seen your faith and prayers help your leaders? What can happen to those who “refrain from sustaining the constituted authorities of the Church”? What are some of the responsibilities of a stake presidency? In what ways can we better sustain and uphold them? Why is it important to know that the bishop holds authority in the ward “from God, not from man”? How can we better sustain the bishopric in their responsibilities? How is the duty of a home teacher “as sacred as the duty of an apostle, in the sphere in which he is called to act”? How can we sustain and honor home teachers and visiting teachers? How is sustaining and honoring our leaders an evidence of our faith in the Lord? Deseret News: Semi-Weekly, 28 Apr. 1896, 1. Deseret News: Semi-Weekly, 14 May 1895, 1. In Brian H. Stuy, comp, Collected Discourses Delivered by President Wilford Woodruff, His Two Counselors, the Twelve Apostles, and Others, 5 vols. (1987–92), 4:298. Deseret News: Semi-Weekly, 28 June 1898, 1. Gospel Doctrine, 5th ed. (1939), 158. Deseret News: Semi-Weekly, 21 Jan. 1896, 1. In Conference Report, Apr. 1902, 86–87. Deseret News: Semi-Weekly, 26 June 1883, 1. In James R. Clark, comp, Messages of the First Presidency of The Church of Jesus Christ of Latter-day Saints, 6 vols. (1965–75), 5:83–85. Deseret News: Semi-Weekly, 31 Mar. 1896, 1. Deseret News: Semi-Weekly, 21 June 1898, 1. In Conference Report, Oct. 1911, 130–31.